This is my 51st post on the Inspy Romance blog! It’s hard to fathom that I’ve written so many. That being said, I don’t remember everything I’ve ever written, so if this is a repeated topic, I hope you will indulge this forgetful writer. Writing isn’t my only job. I also work at a high school, and I love it! Recently, I had the privilege of filling in for a guest speaker who had to cancel. I heard from the teacher in charge that the guest speaker scheduled for later in the week might not make it, so I thought to myself, “I could fill in.” The day the speaker was to be there, I arrived to work a little earlier than normal and asked about the speaker. When I learned she indeed had cancelled, I offered to fill in. I’ve worked with these students all school year and grew up singing on stage, so I didn’t suffer any anxiety about this. I asked my boss what he wanted me to talk about–he made a list, and I went for it. I had also come prepared with a box of my books to pass around to the class so they could see what I do when I’m not with them. It was fun watching them thumb though my books. :) In the upperclassman class a couple of the girls asked to borrow some books. That blessed me big time. I have never in my life had so much fun as I did that day. Telling the students that see me day in and day out about what I do when I’m not with them, and about how I got to where I am today was such a treat. The only downfall of speaking for three hours to four different classes was that by the end of the first class I was already losing my voice–I don’t talk much. Even in my job at the school, I don’t need to speak a lot. 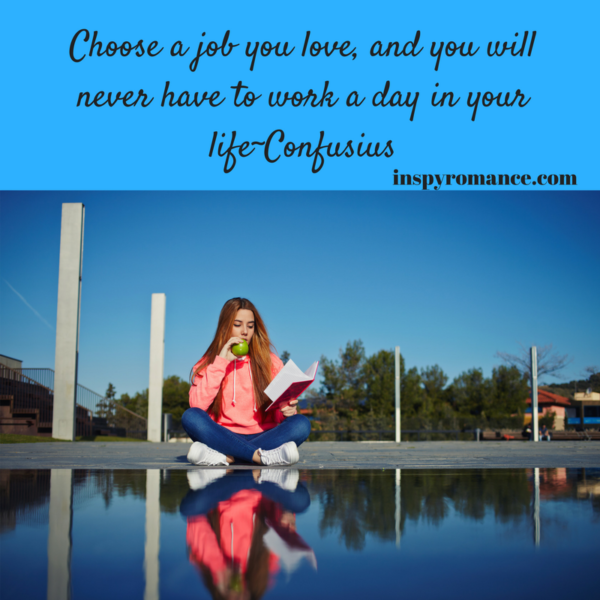 So what does my story have to do with the day in a life of a writer? It’s an example of how no day is exactly the same. This writer, as most do, wears several hats. I’m an AVID tutor part time and also a writer, wife, and mom. I love each aspect of my life–most of the time. :) I’m sure we have all had days where we wonder what we are doing and why. That being said, I suspect my typical day looks similar to yours, although I probably wake up earlier than many of you. :) I begin my day at 5:20–I’m a morning person. If I don’t work at the high school that day I usually have met my word count by 10:00 in the morning. On the days I work at the school I usually meet my goal by 2:00. As much as I love my job, reaching that word count earlier in the day gives me great joy! Once my workout is over, I generally do any household chores that I haven’t already fit into little breaks through out my day. By 3:30 I’m done with everything and ready for my honey to come home. Then it’s family time. I take weekends off and spend my time reading, taking long walks, and running errands. I’ve also gotten into the habit of reading before bed. I wear a Fitbit and it told me I’d taken a nap while I was reading–I didn’t. LOL I remembered exactly what I read. But I discovered through this that, reading is extremely relaxing for me. There you have it, a day in the life of a writer–not glamorous, but I love it. What relaxes you? Feel free to ask questions too. Reading relaxes me no matter where I happen to be, even if you are waiting to see the doctor and he is running an hour late. As much as reading relaxes me, after thirty minutes of waiting for my doctor I lose focus. It’s great that reading has such a strong affect on you! Hi Kimberly, thanks for sharing about your day. Reading and listening to music, as well as being outdoors (mountain biking, hiking, sailing and so on) are all things I find relaxing. I think it is great you were able to share about your books and writing with your students. One of my former students has had her first book published (Gregory and the Grimbockle) which is exciting- and very cool for other students to hear about and see that with hard work and perseverance you can do cool things! I love your hobbies, Wemble. I enjoy many of those things as well. :) How cool about your former student getting published! Good morning, Kimberly, thank you for sharing such an important part of your life! Mentoring to High School students sounds wonderful, they are at an age that can influence the rest of their lives! God Bless you for being a role model for them! Hi Kimberly! Thanks for sharing the life of a writer. I too am a morning person. Started in high school while working at a bakery. My shift started at 5:30 am. Your schedule now sounds similar to when I was teaching high school German, English, and Creative Writing. Definitely enjoyed my work interacting daily with teens, many I am still contact with. I enjoy morning quiet to read and reflect; so during the first week of school, I always lost my voice. Talking five hours a day does that. Now in retirement I now get up at 5:50 am. First grandchild arrives at my door by 7:10, next set arrive at 7:40 and it is non stop till parents pick them up around 4:30. That is how I get my exercise. Chasing a toddler and preschooler. Lifting them up. The 14 month old weighs 25 pounds. Definitely a workout with maybe a nap or quiet time for an hour after lunch. Best wishes and Happy Writing and Reading. Have fun with your grandkids today! Thanks for sharing a little about a typical day in you life. I feel joy in going to the gym and working out with an amazing group of people. Then at night I have to read before I go to bed- that’s always been an habit. Thanks for sharing….I think you have it all worked out very well! You inspire me! Wow Kimberly. I’m stuck on the get up at 5:20. I’m so not a morning person. And my hats off to you and other authors who have a family and a job. I have a family and write and sometimes getting my word count is a challenge. I can’t imagine having a job too. I used to get up early and excercise beforecwork at 8:00 a.m. Now I’m retired and only get up at 5:30 when it’s hubby’s turn to preach. After I retired, I used to exercise before I took my shower, but lately my foot hurts and my other hip. It’s not fun getting old! I’m sorry about your foot and hip, Paula. It’s tough to exercise when those body parts hurt. a cup of coffee and a nice book relax me.